iOS 5 Error 3200 or "internal error" update issues? Apple's servers are getting slammed. Check out all of our coverage of today’s Apple releases here or take this time to read our complete review and guide to iOS 5. If you’re having problems updating your iPhone, iPad or iPod touch to iOS 5, you’re not alone. We’re getting reports across the board that many are having issues updating to the latest version of Apple’s iOS software, released today. The issues seem to center around the point at which iTunes contacts Apple’s servers to verify and activate the update process. 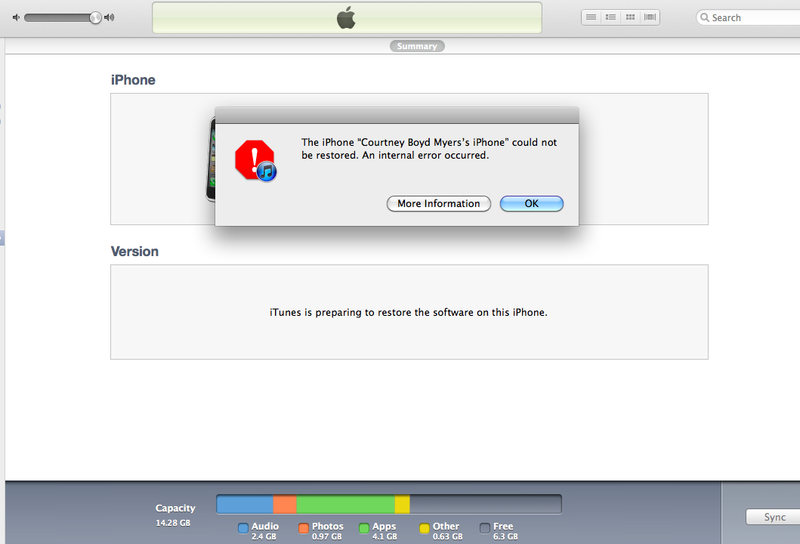 The issues are likely due to the fact that Apple’s servers are slammed and are only handling ‘half’ of the requests. This information comes via Jay Freeman, AKA Saurik, an iPhone jailbreaker and the creator of the Cydia app store for jailbroken iPhones. A 3200, or “internal error”, message is being given to those attempting to update their devices and many are reporting success after trying the update process 5 or even 10 times. The long and short of it is that the demand for iOS 5 is off the charts right now, so being patient is your best option. There’s nothing you can do on your end so have a cup of coffee and wait out the rush. Until then, check out all of our coverage of today’s Apple releases here or take this time to read our complete review and guide to iOS 5. Update: Some sites like Gizmodo and GDGT are reporting that downloading the IPSW and updating manually works. To do that, download the firmware you need from one of the links below. Then open up iTunes, and Option + Click the ‘Check for Updates’ button. Locate the firmware file that you downloaded and install it that way. I’ve seen mixed reports of this method working, as the issue seems to be with the activation servers, not the download servers, but it’s worth a try if you’re desperate. Let us know if it works for you.